Go to Roni-Sue’s Chocolate Shoppe for chocolate truffles, toffees, caramel popcorn, pretzel treats, and other confections. Bacon lovers can’t miss the Pig Candy (chocolate-covered bacon). The café has a cute backyard garden and also offers classes and hosts private events. Roni-Sue uses MOHO Chocolate, direct-trade, single origin 60% dark chocolate from Belize. 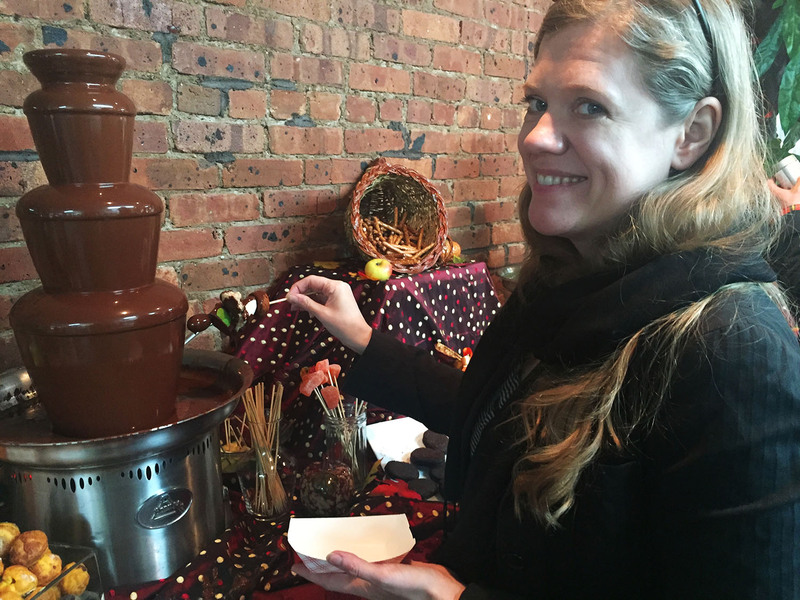 I visited Roni-Sue’s for “Fall Into Chocolate” co-hosted by Divalicious Chocolate Events. 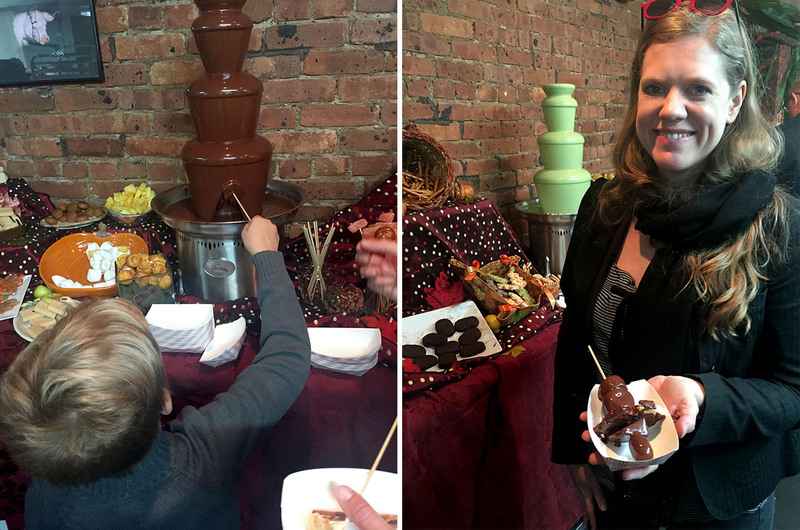 This was a chocolate-dipping party with both a dark chocolate fountain and—something I’d never before seen—a matcha white chocolate fountain. Want one of these for a party? 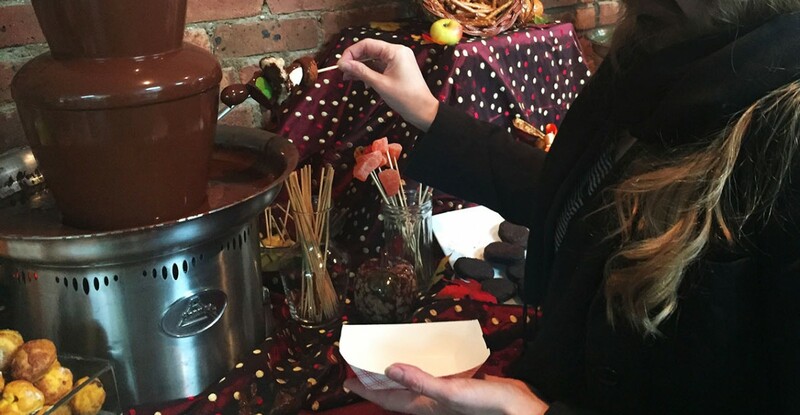 Check out Divalicious Chocolate Fountain Rentals. 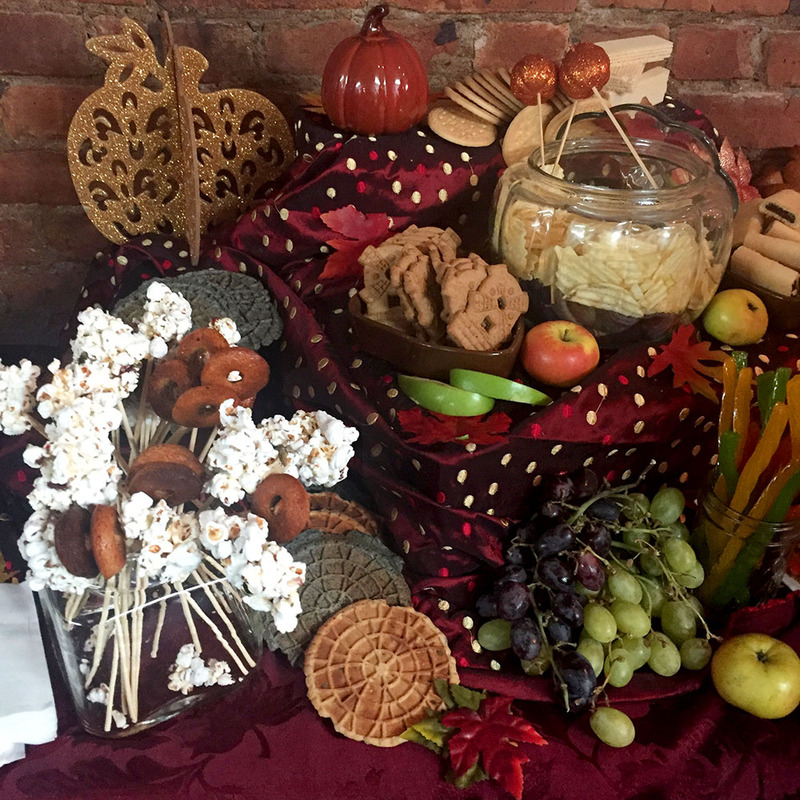 There were strawberries, cookies, pumpkin muffins, pretzels, marshmallows, cream puffs, popcorn balls, gummy candy…and much more to dip. 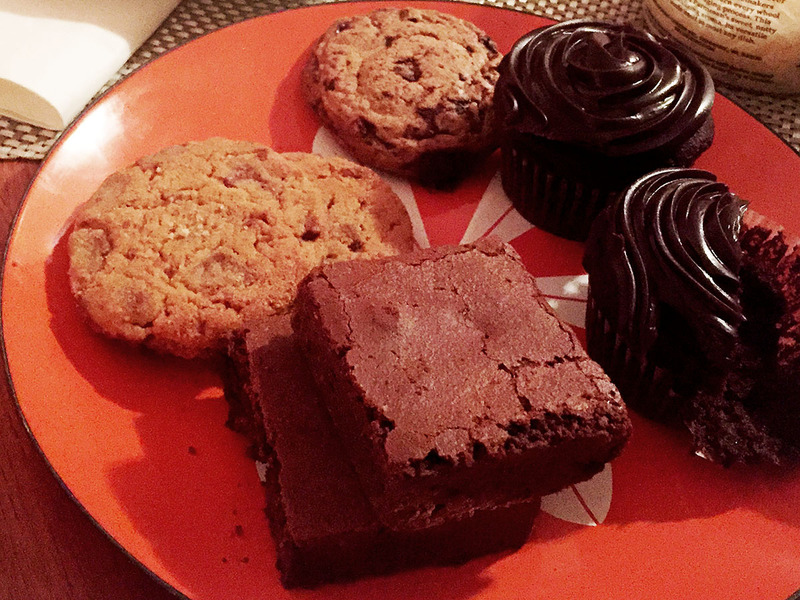 I think my favorite were the rice crispies treats, the chocolate really got into the crevices! 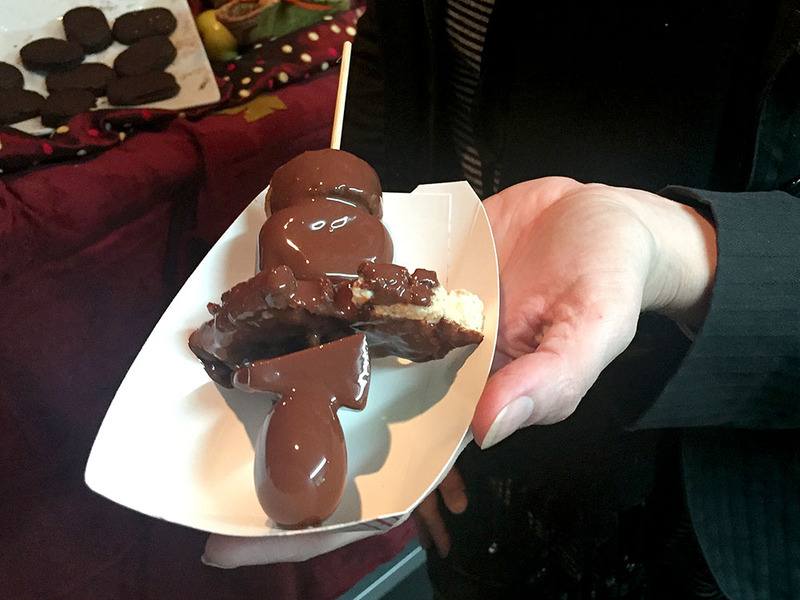 Popcorn, fruit, cookies—including beautiful pizzelles—and even potato chips were perfect dippers for both the dark chocolate and matcha-flavored white chocolate. To wash it all down, there was hot chocolate and hot apple cider with chocolate-dipped cinnamon sticks. 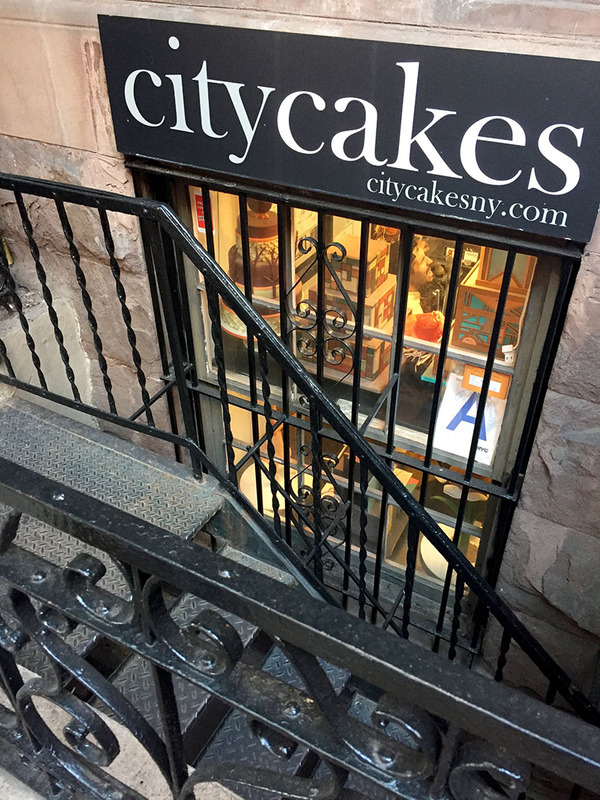 I’ve always eyed this bakery when walking past it on Atlantic Avenue, but I have never quite made it inside. 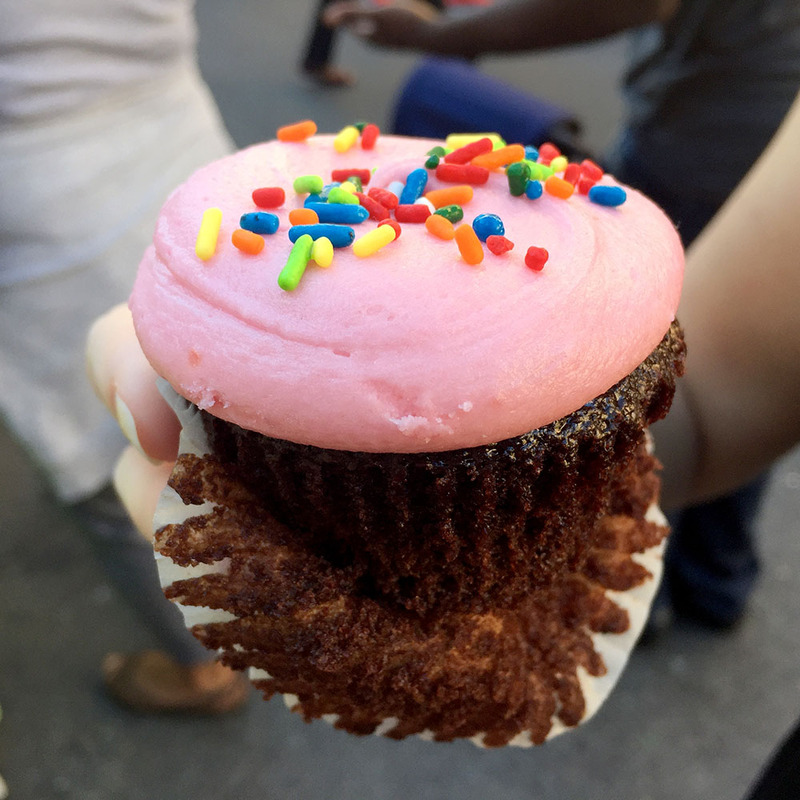 When I saw their table outside the shop during the recent Atlantic Antic—an annual can’t-miss street festival, the oldest and largest in Brooklyn—I stopped to give one of their cupcakes a try. 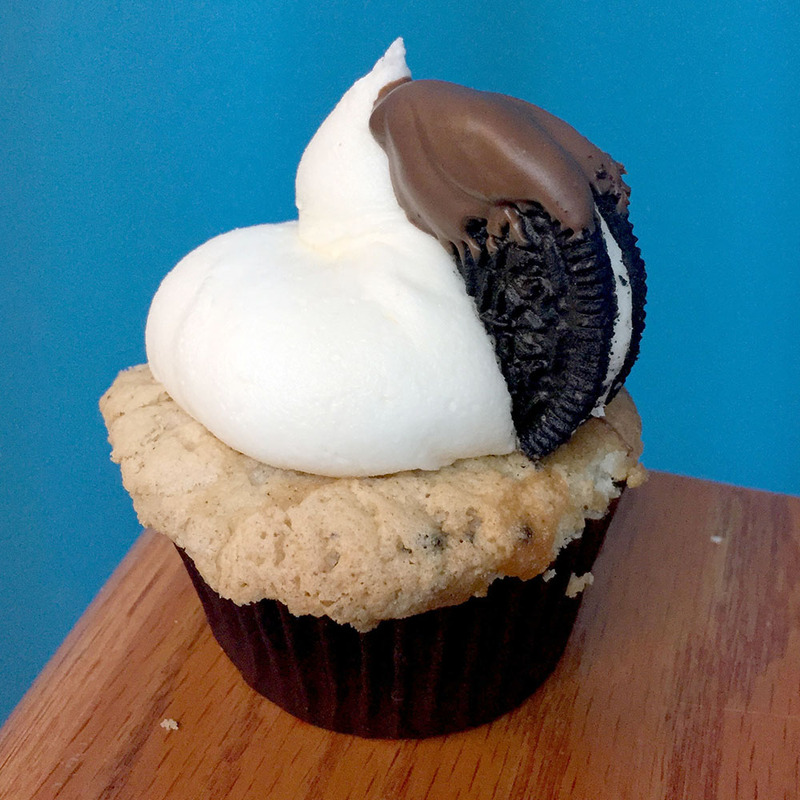 It was a solid no-nonsense cupcake. 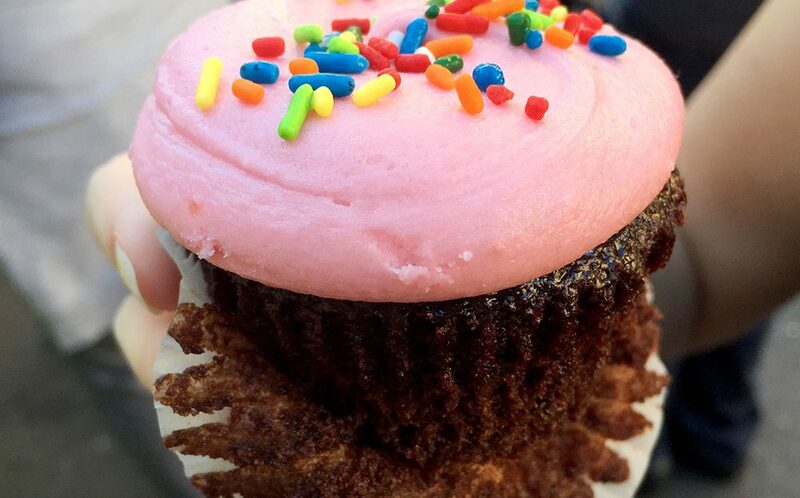 Nothing fancy but some sprinkles, the chocolate cake did the job with a sweet berry punch of strawberry frosting. 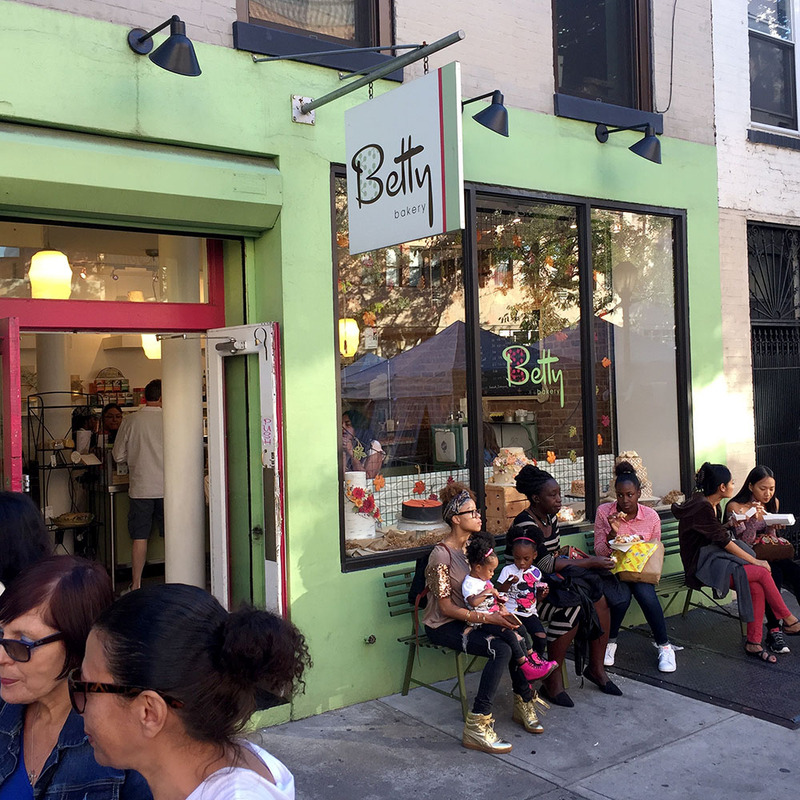 Stop at Betty’s for a sweet break when shopping Atlantic Avenue, where you can get spices, furniture, knick-knacks, or maybe even a wedding dress. 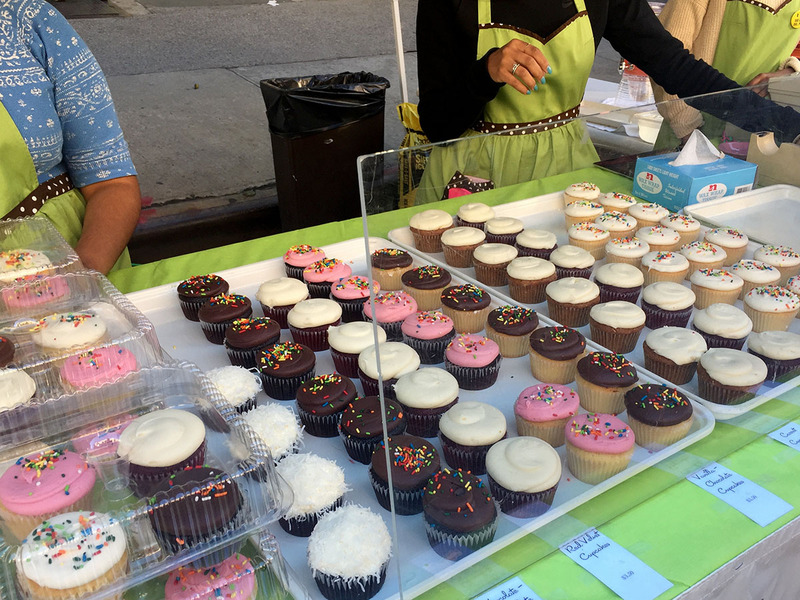 Though it calls itself “the cake shop known for cookies,” City Cakes–quite a small bakery with only one oven–serves up a gorgeous array of gourmet cupcakes on a daily basis. 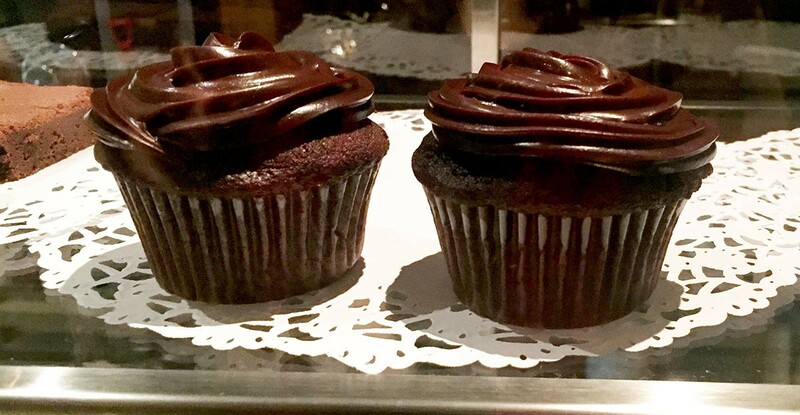 City Cakes offers classics alongside innovative creations. 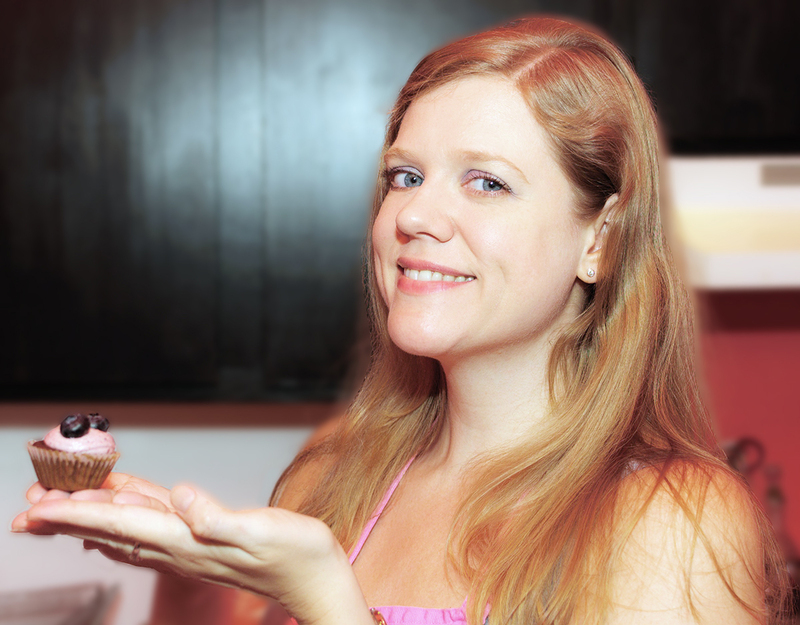 Here are the flavors I recently tried with a few trusty tasters. 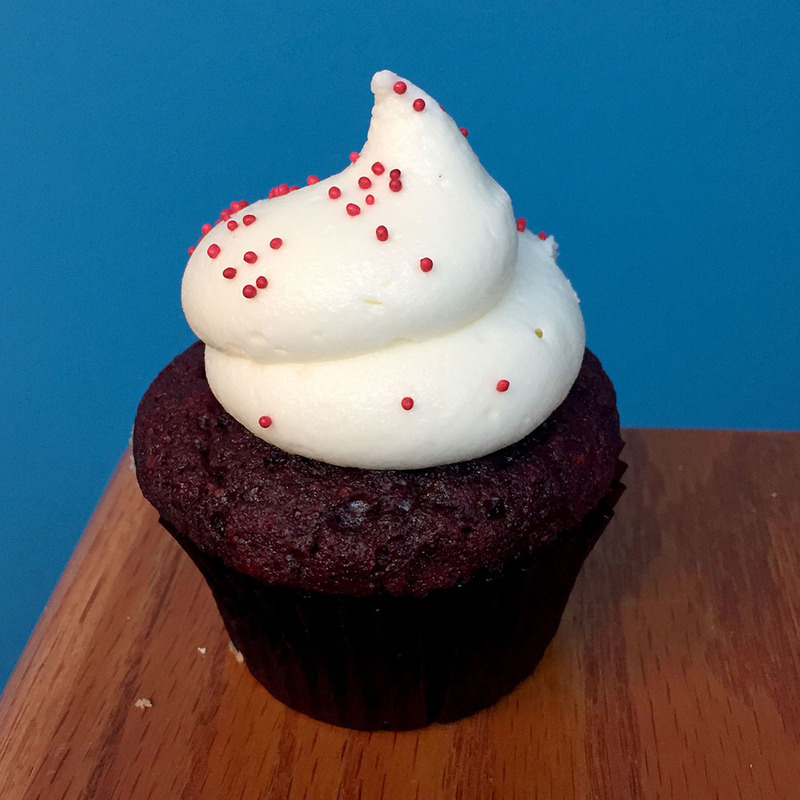 A good red velvet is a must, and City Cakes’ Red Velvet Extravagance is a nice, moist cake and frosting with just the right balance of cream cheese. 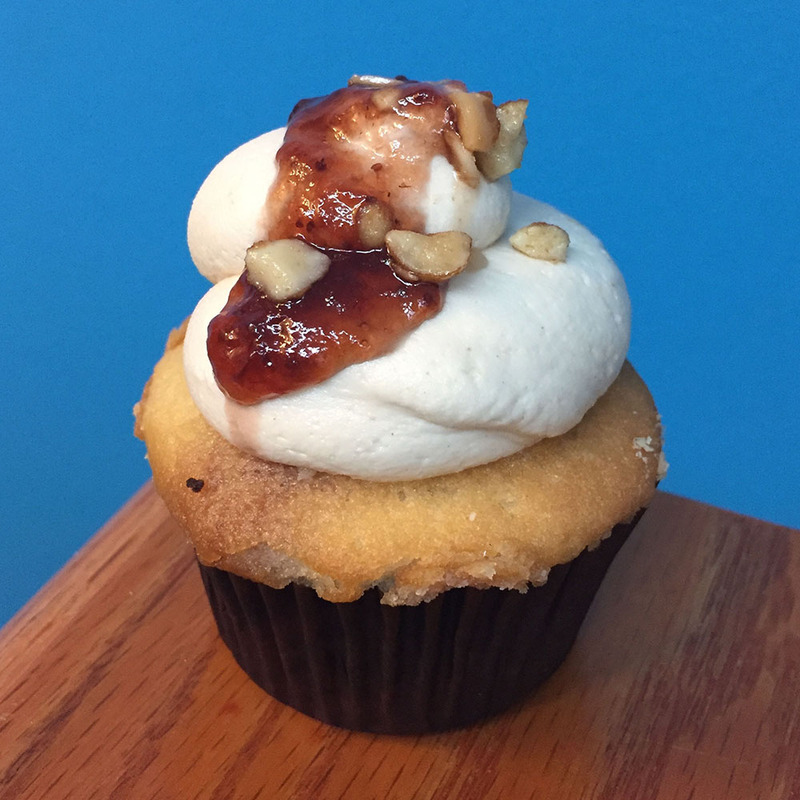 City Cakes’ special Peanut Butter & Jelly cupcake has “white bread” cake filled with, yes, peanut butter and jelly, covered with a light peanuty buttercream with some jelly on top. One taster wanted more peanut butter and was a little thrown off by the “bread” cake, finding it too dense. 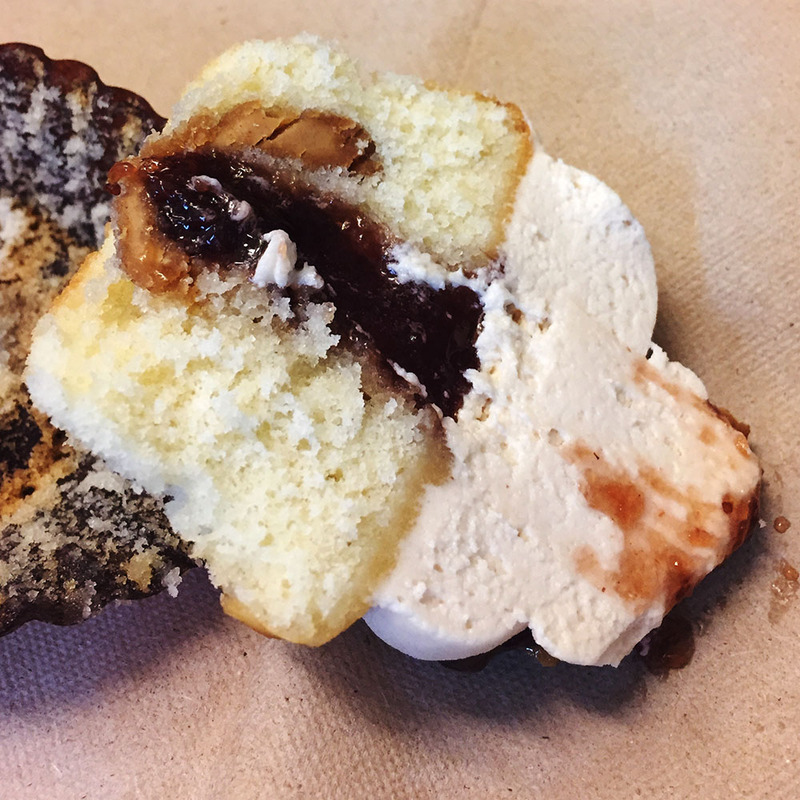 It is a different sort of cake from the norm, but it hits that PB&J sandwich nail on its head. 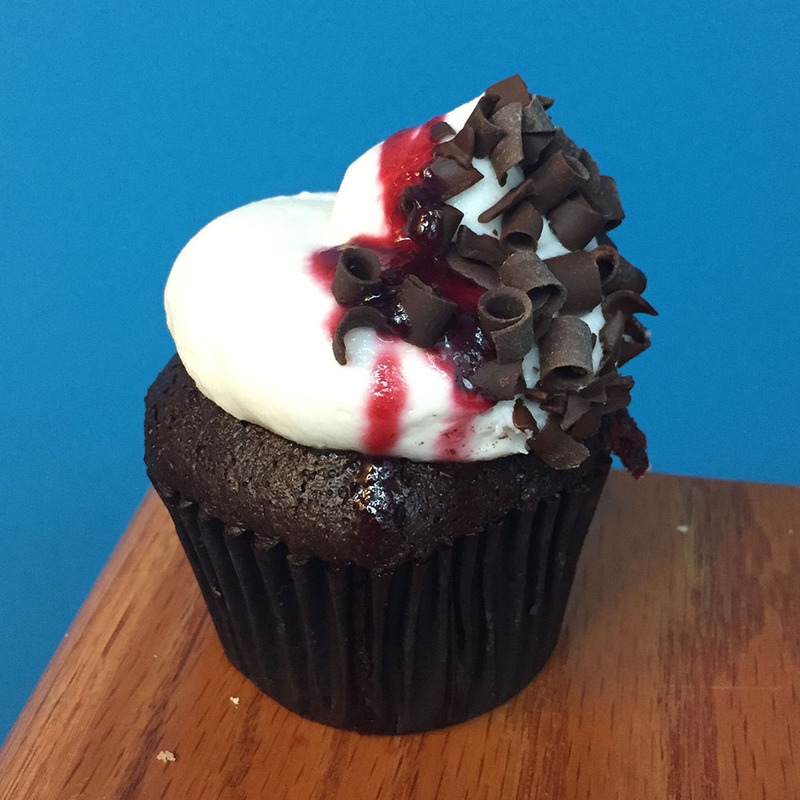 The Flourless Dark Chocolate Cupcake filled with raspberry purée from City Cakes is a tasty gluten-free option. It’s a powerful punch of chocolate and raspberry that I really liked. Great with coffee (milk, no sugar). The cupcakes aren’t all on offer. City Cakes’ famous cookies deserve their own post, as do its crazy-dreamy sculpted cakes (this one will do for my next birthday, thanks!). 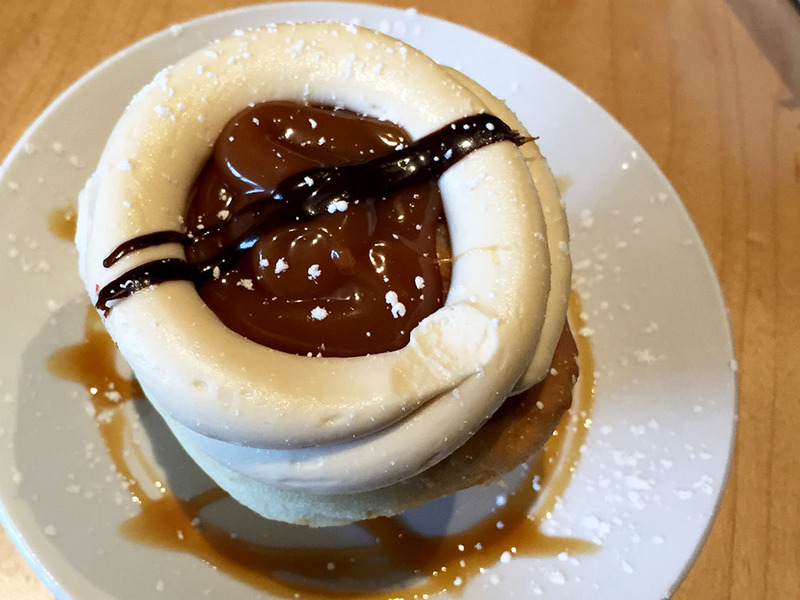 Venture downstairs to try these treats for yourself! I lived in Cobble Hill until recently and had noticed this bakery preparing for its opening before my move. The spot used to be Coco Roco, a Peruvian place whose roasted chicken with rice and beans is a favorite of mine (their Park Slope location is still open, go get some). 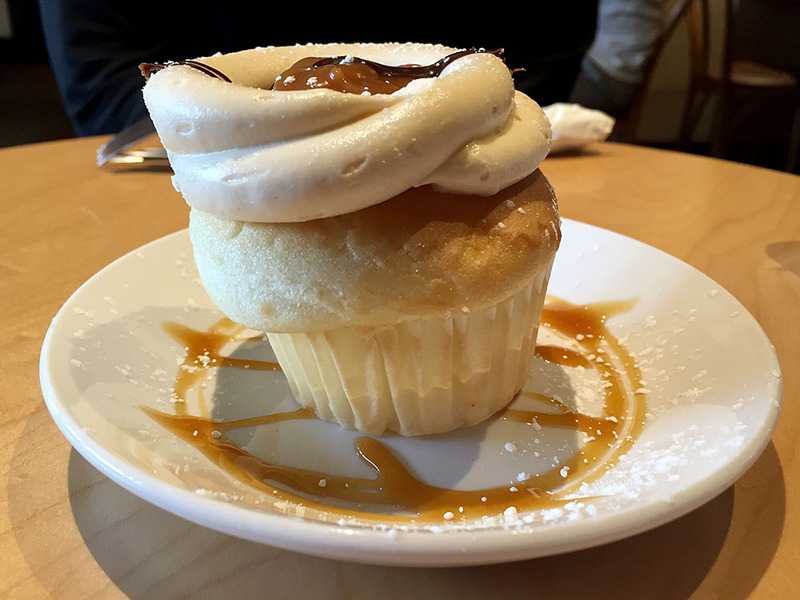 I stopped by recently and tried the Salted Caramel cupcake and a cappuccino. 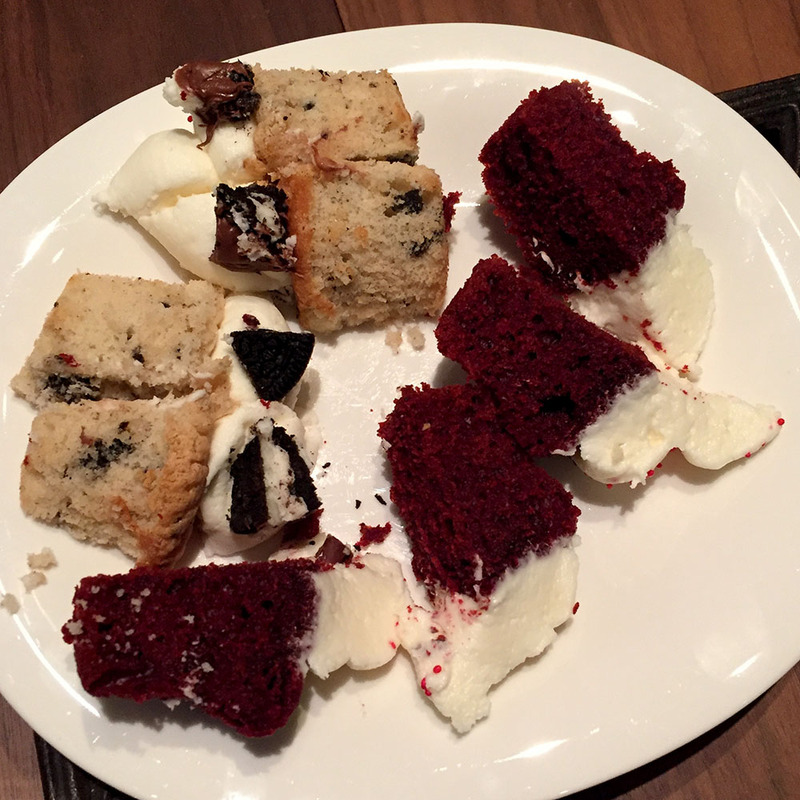 The cake was light, like angel food cake rather than a typical vanilla cupcake. 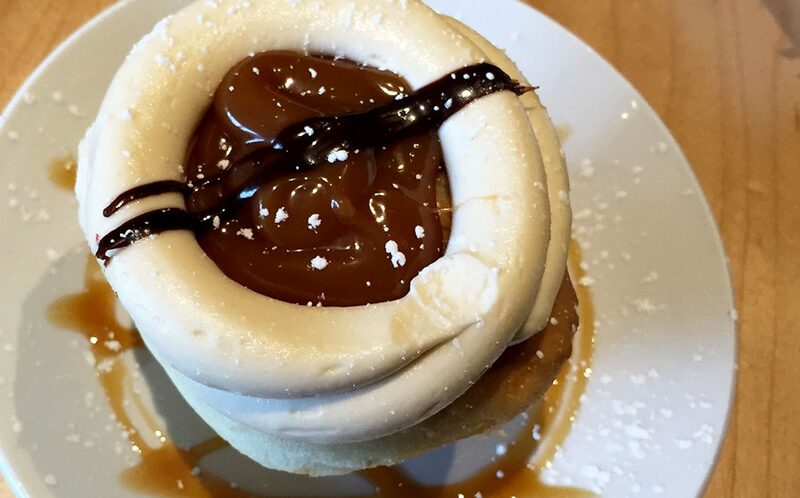 It made me feel less guilty about the thick frosting (buttery, not too sweet) with a generous dollop of salty-sweet caramel. With ample seating both indoors and out, Mia’s is perfect for a shopping break, a leisurely afternoon, or a dessert date. 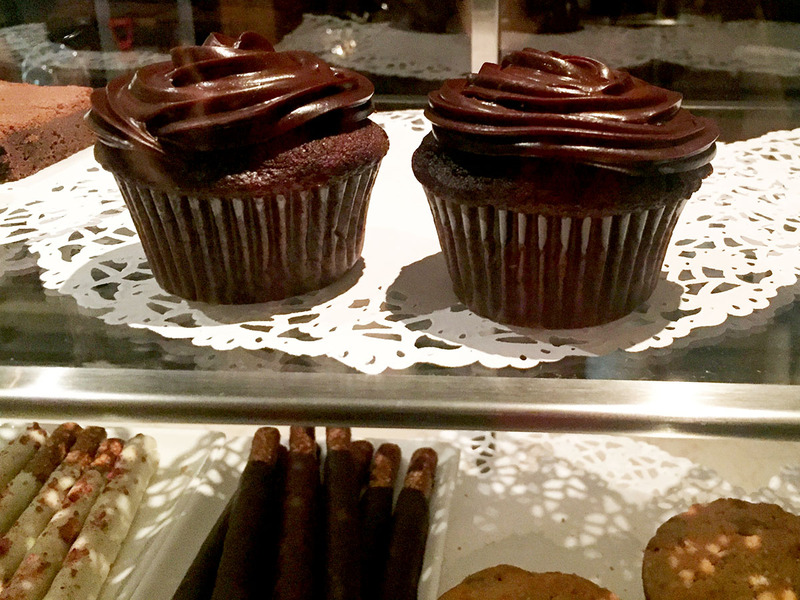 The bakery offers coffee, a wide array of sweets, and a few savory breakfast options. 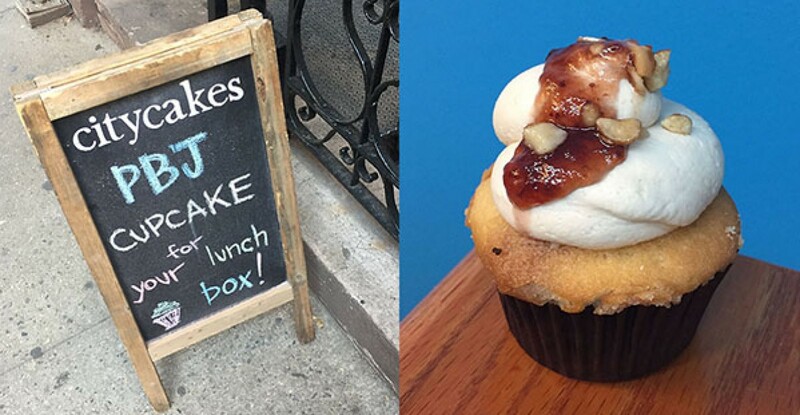 Mia’s Brooklyn is open until 11pm on weeknights, 1am on weekends.